Building with their hands helps children become better problem solvers. Today I am sharing 5 different ways to encourage tinkering at home. While Oxford dictionary defines tinkering as an attempt to repair or improve something in a casual or desultory way, often to no useful effect, I don’t think of children's tinkering in the same negative way. I like a definition from my daughter’s favorite museum, The Exploratorium, a lot better – tinkering is thinking with your hands and learning through doing. It’s slowing down and getting curious about the mechanics and mysteries of the everyday stuff around you. When children tinker with things, they discover new uses for uncommon objects, think out of the box and grow as learners and problem solvers. 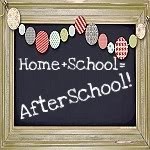 Today I am going to share 5 ways to encourage tinkering for kids from After School Hosts and After School Link Up participants. Even very young kids can benefit from a “tinkering station” inviting them to combine different objects together. Anne from Left Brain Craft Brain was a guest on A Mom With a Lesson Plan last week and shared her tips on setting up a tinkering station for preschoolers. Katydid and Kid has a great post on a tinkering kit for older kids. It’s great when parents join the play to show kids how to extend their toys and combine them in new ways. Doodles and Jots has a great example of “hacking” TinkerToys and combining them with some empty cardboard boxes to make a Tinker Truck. Junk modeling is tinkering with recyclable materials. In our house it usually involves a lot of scotch tape or a glue gun and the results are interesting, but not photo-friendly :) In The Playroom shares a more artsy junk model of a pretty butterfly family. She also has a great round up of 10+ Junk Modeling Crafts. My daughter loves engineering challenges, and I am happy that this year she already had one in school where kids were asked to work in teams and create vessels out of foam craft sticks and paper clips. Then the teams competed to see which vessel can hold most counting bears without sinking. I hope she will have more of these challenges in school this year, and we also had some at home last school year when we made Lego egg racers and built boats. I also really love the way my co-host Relentlessly Fun Deceptively Educational designed this paper building challenge for her son. I wrote about it before – as any true creative undertaking, tinkering requires time. This fall my daughter takes a fair share (somewhat more than normal for us) of afterschool activities of all kinds (choir, gymnastics, Mad Science, musical production in school), but this makes it even more imperative for us to keep our weekends free, so she can enjoy unstructured time. That’s when she actually play with her toys, and builds intricate play worlds including this Duplo playground. Doorknob Science – I love how my co-host MaryAnne from Mama Smiles: Joyful Parenting and her husband show their kids how things work. 3 Parenting Tips for Raising Engineers from my other co-host Amanda at The Educators’ Spin on It. Our results aren't photo friendly either, but they do enjoy them. Wish our kids had more time in their school setting to tinker and learn. Thanks for sharing ideas so we can set it up at home. So many educational kids' activities aren't photo friendly - but kids get a lot out of them! I love the diverse range of ideas you shared in this post - and thank you for sharing my doorknob post! Love this post! Tinkery is our middle name. The only problem is all of the projects are taking over our home. But I love it and encourage it! I love that Tinker Truck! My daughter can't wait to try it. Thanks so much for sharing my Tinkering Station for Young Engineers, too. I love all of the tinkering ideas! Especially the butterflies! Hi Natalie, I love all the ideas you have for tinkering. Thanks for sharing at the #Lovetolearnlinky. I am planning on featuring your post. Please stop by again to see your feature and link up again. Have a great day! What great ideas for tinkering! I love it!! Thank you for sharing at Sharing Saturday!! Great ideas to ignite a child's creative thinking! This is such a great collection of fun, tinkering ideas. I saw my third grader in almost everyone of your suggestions, especially the building with paper suggestion. Fabulous! Thank you.